Ariel of Victoria’s keel was laid in Fred Peterson’s boatyard on Vancouver Island near Nanaimo in 1972. Carvel planked in Alaskan yellow cedar over oak frames with a western red cedar deck, she was launched in 1980 after “seven years of madness” by Ronald Hunt and Peterson. Doug & Jane Bond bought her in Victoria and raised two sons aboard, sailing her in the Salish Sea and participating in the local racing community. In 2009, Jane sold Ariel to Christy Granquist who, with Daniel Joram, brought the boat to Seattle and began a hull & systems restoration/renovation project (planking, frames, transom and aft cabin, electrical, water, sewage). In 2012, another renovation push involved a new galley, engine rebuild, fuel & exhaust systems. And in 2015, she was hauled out for 18 months to rebuild her decks and main cabin, re-cork, fair, install new steering & nav systems. 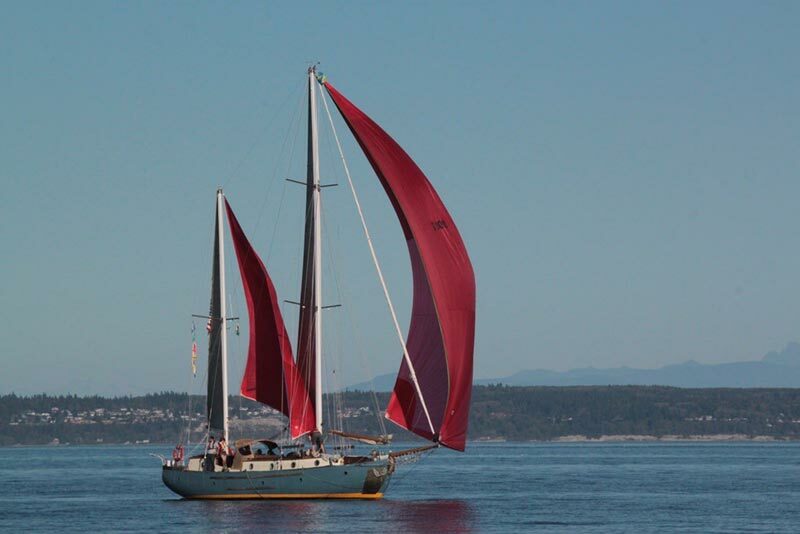 In between all the projects Ariel of Victoria sails extensively, covering 5000 miles in the Salish Sea between 2010 & 2015, and racing in several local events. We are looking forward to taking her further in the coming seasons.